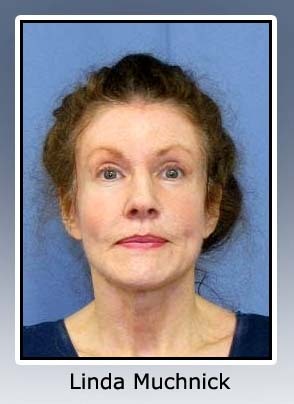 PENNSYLVANIA -- A judge has determined that a former Towamencin woman's mental condition prevented her from understanding the consequences of her actions when she allegedly poisoned her cats, reportedly "so they could be in heaven together." Montgomery County Judge Steven T. O'Neill determined Linda Muchnick, 57, formerly of East Bishopwood Boulevard and most recently of Pottstown, was not guilty by reason of insanity on multiple counts of animal cruelty and attempted cruelty to animals in connection with an August 2009 incident at her former home. Specifically, O'Neill determined that at the time of the Aug. 20 incident, after which 12 of the 29 cats found in Muchnick's home died from complications of ingesting rat poison, was suffering from a mental disease or defect that prevented her from knowing what was right or wrong or understanding the consequences of her conduct. Muchnick showed no emotion in court on Monday as the judge made the ruling. period to the Montgomery County Emergency Services facility in Norristown after her arrest. While Muchnick faces no further action under criminal laws, under a so-called civil commitment, the judge ordered Muchnick to continue with outpatient mental health treatment. "You have to follow all of the treatment recommendations," O'Neill told Muchnick, advising her to focus on her mental health treatment at this time rather than trying to get the surviving animals returned to her. The surviving 17 cats and one dog have been in the custody of the Montgomery County Society for the Prevention of Cruelty to Animals since the incident. Technically, now that she's been found not guilty of the crime, Muchnick could petition the court to have the animals returned to her. "She hopes to get her animals back," defense lawyer Adam Katzman said on Muchnick's behalf after the hearing. "She's upset. She hopes for the best." Assistant District Attorney Abby Silverman vowed to fight any attempt by Muchnick to regain custody of the animals. At that point, a separate evidentiary hearing would have to be held. "Even though she was found not guilty by reason of insanity, her conduct still means she should not get these animals back," Silverman said. The SPCA is currently in a holding pattern when it comes to the surviving animals and cannot put them up for adoption either until a judge, during a separate hearing, rules Muchnick can't have the animals or until Muchnick voluntarily relinquishes custody of the animals. As of April 29, the SPCA has incurred $19,284 in expenses caring for the animals, according to Silverman. 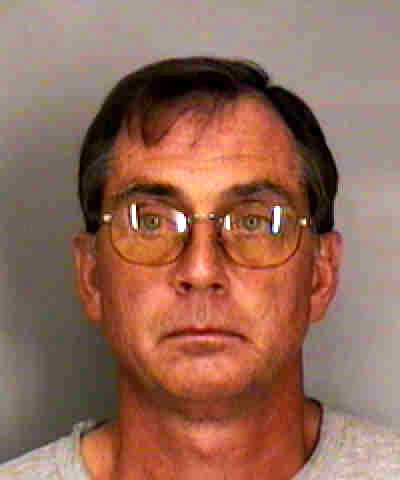 The judge stopped short of predicting the future of animals in Muchnick's care. But referring to the Aug. 20 incident the judge said, "They are horrific acts against innocent animals. All they did was love her." 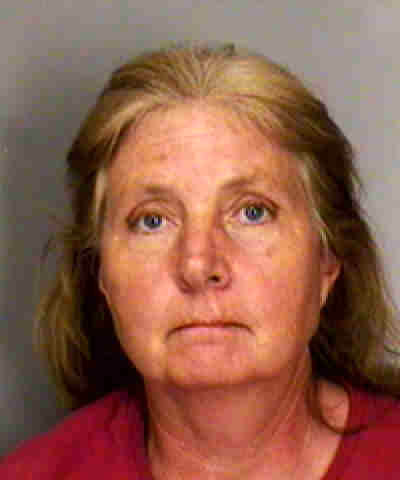 Muchnick allegedly told authorities she fed the animals rat poison because she faced financial problems. Prosecutors called the case "sad" but said they had to charge Muchnick because she had other avenues in that she could have taken the cats to the S.P.C.A. or could have found alternative homes for them instead of allegedly choosing to put rat poison in their rooms where they had nothing else to eat. Court papers indicate the investigation began about 1:20 p.m. Aug. 20 when Towamencin and Lower Salford police investigated a report that Muchnick notified the Harleysville Veterninary Clinic that she intended to kill herself and her collection of pets. "In the note, Muchnick stated her building financial issues made her realize suicide was the only solution," police alleged in the arrest affidavit. "The note read Muchnick thought it would be best for her pets if she killed them along with herself so they could be in heaven together." Towamencin police went to Muchnick's home to check on her well-being. 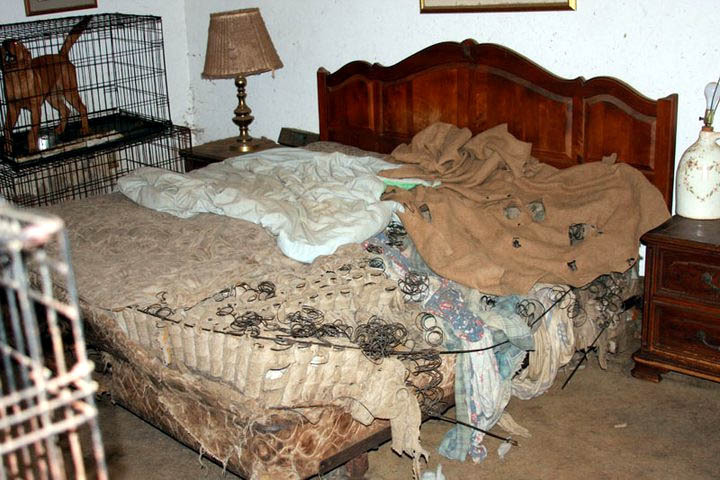 Receiving no response from anyone inside the home, police entered the residence and found 29 cats inside two locked bedrooms. The temperature and humidity were high and there were no windows open in the rooms, police said. Muchnick, conscious but incoherent, was found lying on the floor of a third, locked and poorly ventilated bedroom, along with a sickly pit bull dog, according to court documents. During the investigation, authorities found animal food bowls that appeared to contain moldy food. However, on closer inspection, authorities realized the blue, moldy-looking substance was actually D-Con Rat Poison, according to the criminal complaint. Police also found an open container of the rat poison in a dresser of the bedroom where Muchnick was discovered, according to court documents. UNITED KINGDOM -- A dog which has mauled a string of pets in the street has been granted a stay of execution by magistrates. Three-year-old Bull Mastiff Osya shook one dog “like a rag doll” and bit two men in an attack in Kemp Town last year. Council workers and horrified witnesses yesterday said they were disappointed by a court decision not to have the dog destroyed. 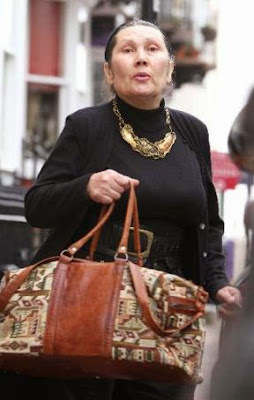 Dog owner Asiya Sitaeva, 61, was fined £4,000 by magistrates and banned from taking her pet out, after she lied about where her dog was to stop it being seized. On December 10 last year Osya escaped from Sitaeva's home in Broad Street, Brighton, and attacked a smaller dog being walked by owner Gary Murphy. Witnesses said Osya pinned the dog, called Benny, and “shook him like a rag doll”. Drinkers at the nearby Marine Tavern ran outside and kicked and punched Osya to try and get him off. Mr Murphy and another man, Laurence Newell, were both bitten on the hand trying to free Benny from Osya's jaws. Sitaeva tried to protect her own pet, shouting: “My poor dog, my poor dog” and told them “my dog didn't do anything”. Benny needed £800 worth of veterinary work for injuries including a broken jaw. When Brighton and Hove City Council animal welfare officers and police went to Sitaeva's home to seize Osya, she claimed she had given him away to a couple of complete strangers on the seafront. But at Brighton Magistrates' Court yesterday she admitted she knew where the dog was being looked after. At the time of the attack Sitaeva, who also has an address in Albany Villas in Hove, was already under a court order to keep Osya under control. He had been castrated after a series of attacks on other dogs on Brighton seafront in June last year. The 61-year-old admitted owning a dog which injured two people while dangerously out of control in a public place and breaching the earlier order. Her barrister Giles Morrison asked the court not to have Osya destroyed under the Dangerous Dogs Act but to impose tougher conditions on its care. Magistrates imposed a “contingent destruction order” meaning Osya will be put down if Sitaeva does not obey a new order. She was barred from walking the dog in public and told only an adult aged between 18 and 55 can walk the dog. Osya must be muzzled and on a lead at all times in public and must be kept on a long lead if in a private garden. Sitaeva, was ordered to pay £4,439 including more than £2,000 prosecution costs, £500 compensation to the men Osya injured and a £500 fine for breaching the original order. She was also ordered to pay Benny's vets' bills. Outside the court Sue Watson, animal welfare officer, said: “What if Osya sees another dog and decides to go for it? FLORIDA -- A Polk County husband and wife running a nonprofit rescue group for abused dogs were slapped Thursday with 261 charges of animal cruelty. 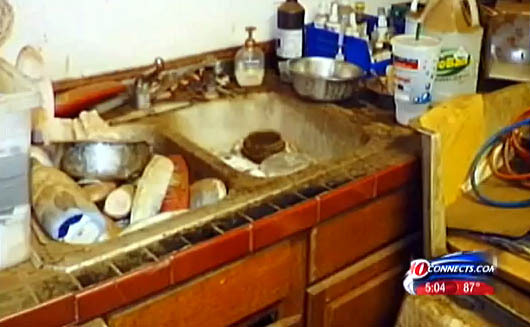 Sheriff's officials, who run the county's animal-control agency, said the home of Charles O'Malley (aka Chuck O'Malley) and Diana O'Malley in Polk City, was filthy with urine and animal feces. It was so bad, deputies and animal-control officers had to wear face masks when inside, officials said. "To call it horrific or shocking... those are just too common to describe the total filth in this house," Polk Sheriff Grady Judd said Thursday night. The O'Malleys were arrested about 4:30 p.m. and were booked into the Polk County Jail Thursday night with bail set at $130,500 each — $500 per charge. 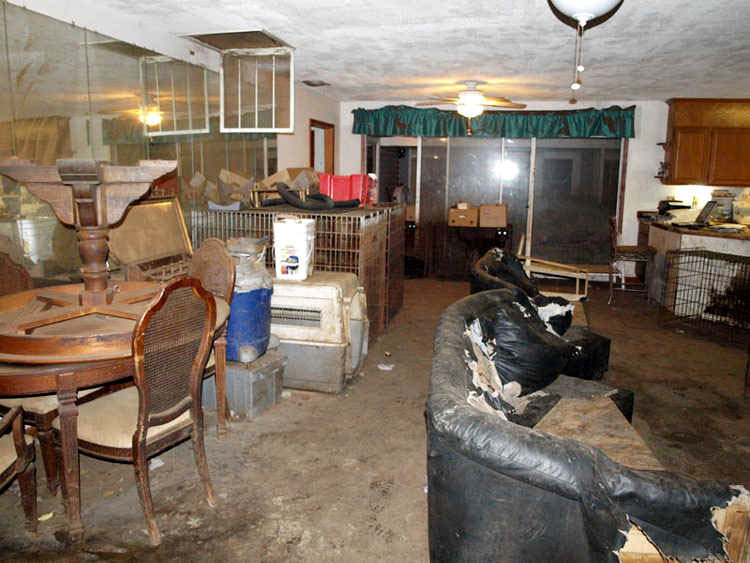 They're accused of neglecting 261 dogs in their 3,000-square-foot home and on their property. 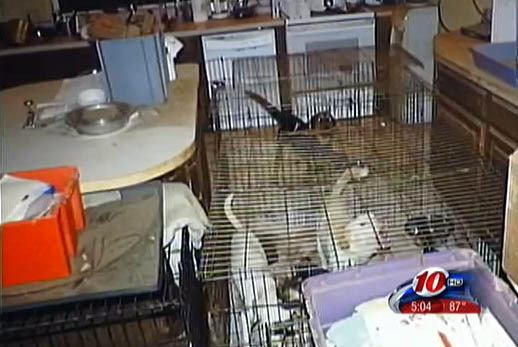 The couple runs Mid- Florida Retriever Rescue Inc., which Sheriff Grady Judd found ironic. "If you check their website, they make you put up $25. They want to check you out to make sure you're the right fit, that your home is clean and safe," Judd said. Deputies and animal-control officers said the dogs were malnourished, infested with fleas and in poor health. "These animals have been neglected, mistreated, and were living in deplorable conditions," Judd said. 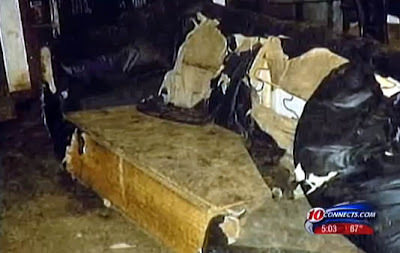 When investigators entered the home on Wednesday, Deputy Mike Burdette wrote, he saw "wall to wall dogs throughout the residence." Burdette said he "observed dogs in every room in the residence, to include closets, bathrooms, bedrooms, kitchens, porches, etc." He noted there was not enough food or water for the animals. The officers began to load the dogs into animal-control vehicles Wednesday, but just before midnight Wednesday, after 117 dogs were transported to Animal Control, the O'Malleys said their lawyer told them to stop unless a search warrant was provided. Deputies - stopped removing dogs from the ammonia-filled home, but maintained the scene as a crime scene so the O'Malley's weren't able to go inside, grab dogs and run off with them. A deputy returned and provided the warrant to the O'Malleys about 2:30 a.m. Thursday and they went back to removing more dogs from the disgusting house. By mid-morning Thursday, all the animals were seized and brought to Animal Control to be treated and recorded as evidence. 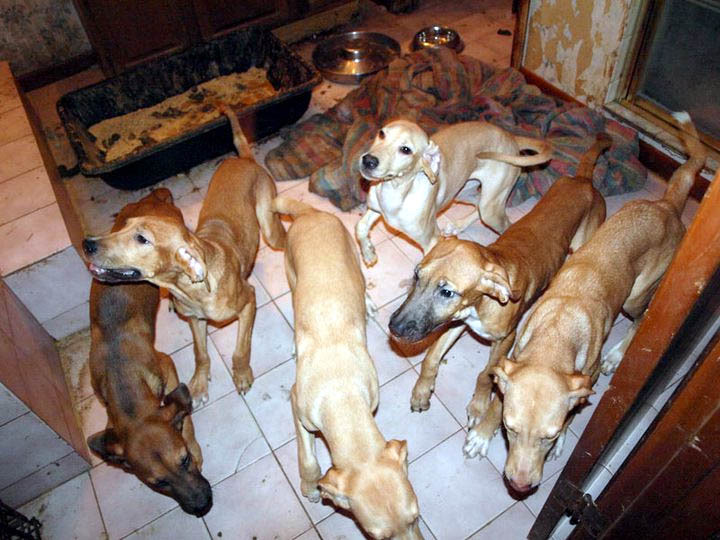 In all, 261 dogs and a bull were removed from the couple's property. The bull was healthy but was seized because no one would have been able to care for it with the O'Malleys in jail, Judd said. He said the couple lived in the home, including their master bedroom which had animals and their excrement scattered on the floor and bed, with its springs ripped from the fabric. Burdette said he "observed dogs in every room in the residence, to include closets, bathrooms, bedrooms, kitchens, portches, etc." "All items of furniture were observed destroyed," he wrote in the arrest reports. "The flooring of the residence was removed and bare concrete was throughout the residence, which was covered with feces and urine. The walls inside the residence are scratched and holes chewed through them throughout the entire residence." Several dogs were aggressive and two deputies were bitten during the operation, Judd said. Animal Control veterinarian Joe Ertel was still examining the dogs Thursday with the help of local veterinarians. Nearly all of the dogs were infested with fleas, had parasites like hookworm, were malnourished and had tartar buildup on their teeth, officials said. Judd said one way to help make room at his shelter for the huge number of dogs would be to adopt other animals. He said the poor conditions at this rescue group shouldn't be seen as an indictment on all. "Rescue groups are very important to us," he said. Mid-Florida had no reports of abuse on file. "Why this group got so out of control, I don't know." The reason it got so out of control is because these hoarding type of people are drawn to the rescue business and so many people push for "no kill" that shelters are willingly handing over animals - no questions asked - to people who claim to be successfully finding homes for them. If someone shows up and says they found homes for five dogs, gimme five more -- HOW ABOUT YOU GET PAPERWORK AND CONTACT THE ADOPTER AND VERIFY THIS INFORMATION so you don't find out later it - along with all the others you blindly handed over - has been suffering - and dying - in conditions like these? Of the 261 dogs seized, 35 are puppies. Among the breeds seized were Labradors, Golden Retrievers, Lab mixes, Great Danes, Australian cattle dogs, Shar-Peis, Dalmatians, Shepherd mixes, bulldogs and Belgian Malinois. Several had not been neutered or spayed, which is against rescue-organization policy. FLORIDA -- A Seminole man was hospitalized this morning after he was mauled by his dog, a German shepherd-Rottweiler mix, according to the Pinellas County Sheriff's Office. When deputies arrived at the mobile home about 3:50 a.m., they found resident Richard Blackey, 51, crawling out of his bedroom with the dog attacking him, sheriff's Sgt. Tom Nestor said. Nestor said Blackey's girlfriend was trying to pull the canine off him. Blackey had numerous bite marks on his arms, chest and neck and was in no condition to give a statement, Nestor said. 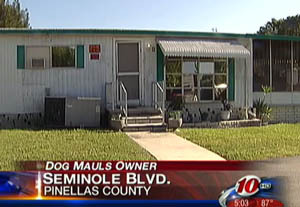 He was taken from his mobile home, at 10675 Seminole Blvd., by ambulance to Bayfront Medical Center in St. Petersburg. 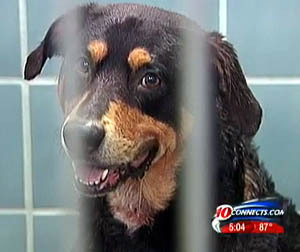 Mickey, a 95-pound, 6-year-old canine, is at Pinellas County Animal Services. He has been put under a 10-day rabies quarantine, which is routine whenever a dog bites a human, said John Hohenstern, a senior animal control officer with the agency. Blackey's girlfriend, Melissa J. Howell, 35, told investigators she and Blackey had been in their bedroom watching television with Mickey in the room. She said Blackey went into the kitchen to make himself a plate of food. Howell said she eventually joined him in the kitchen, and Mickey stayed behind. As Blackey returned to the bedroom with the plate of food, Howell heard him yelling and the dog growling, Nestor said. She went to the bedroom and saw the dog attacking Blackey. She grabbed Mickey by the collar and pulled him away, but the dog was able to slip out of his collar and resume the attack, she told investigators. Howell continued trying pulling the dog away, but the animal bit her, Nestor said. She ran to the kitchen and called 911. Howell was treated for her bite and released at the scene by paramedics, Nestor said. There appeared to be no motive for the attack. Howell said Blackey has had Mickey since the dog was a puppy. She said the dog had bitten Blackey on one other occasion a few years ago, but the bite was not reported. Susan Englund, a neighbor, said news of the attack was odd and alarming. She said Blackey is typically seen walking the animal on a leash, or the animal is seen sitting motionless at Blackey's feet. "I know that Mickey is a very loyal dog usually to them," she said. "The only time I heard him bark is when somebody knocks on the door." Englund's dog has never had a problem with Mickey. "He's always been a great dog," Englund said of Mickey. 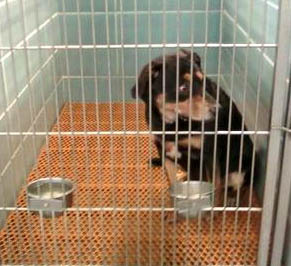 When the animal's owner is bitten, it's up to the owner whether to take back the pet after the quarantine, Hohenstern said. "If an owner wants his dog back, he can get his dog back," Hohenstern said. "If the owner thinks Mickey is a dangerous dog and no longer wishes to own Mickey and does not reclaim him, that will be it for Mickey." 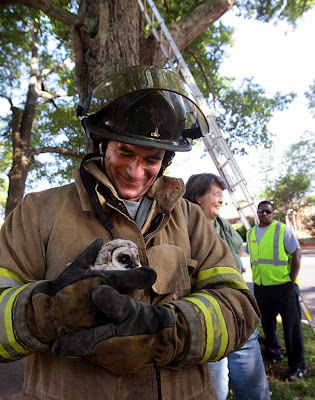 SOUTH CAROLINA -- For about two months, Chuck Lister and his family have had a regular guest at their Anderson home — a female owl. She came to their back yard for several weeks before she ever built a nest in the water oak across the street at Boulevard Baptist Church. She laid three eggs, and three weeks ago, hatched three babies. The Lister family got used to keeping watch on the mama and her brown-eyed young, called barred owls because of the faint stripes across their chests. Lister said just about anybody from his house could step outside, call, “Babies, babies, babies” and see the mother within just a few minutes. 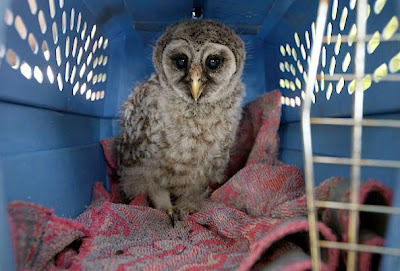 On Tuesday, the mother owl was hit by a car and killed. Chuck Lister immediately went about looking for a rescuer for the tiny orphans across the street. 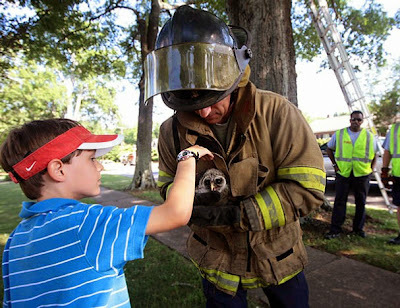 His call was answered by Linda and Mike Hoskinson of Piedmont, licensed rehabilitators who have never turned away any kind of injured or abandoned wildlife. The Hoskinsons are part of Wildlife Rehab of Greenville, a small group of Upstate rescuers. Linda Hoskinson has been doing wildlife rehabilitation for three decades, and her husband “married into it” seven years ago. The couple care for about 250 animals every year. The Hoskinsons waited at the base of the tree Wednesday for Anderson firefighter Billy McCullough to rescue one of the owls in the oak, cradle it, and bring it down a ladder unscathed. It was the second rescue in two days; the Hoskinsons got one of the babies on Tuesday and are still hoping to find the third. Made of hollow bones and built for flight, the baby owl rescued Wednesday weighed a little less than a pound. It looked like a ball of brown and gray feathers with eyes and a beak. 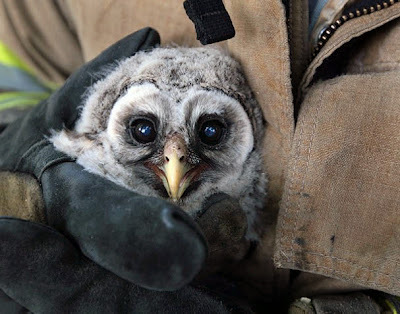 The baby owl made a click-click-click sound when it was placed inside a cat carrier, but soon, it calmed down and was quiet. “He knows he’s safe,” Linda Hoskinson said. 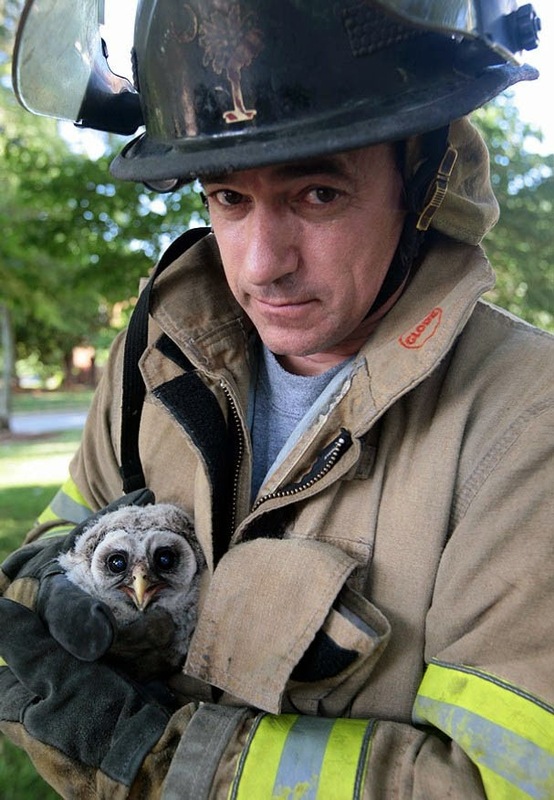 The two baby owls will stay with the Hoskinsons until Saturday or so, when they will get a ride from another rescuer to the Carolina Raptor Center in Huntersville, near Charlotte, N.C. In the meantime, the owls will sleep alongside some rescued squirrels and six baby skunks found under a house in Columbia. And they will have a steady diet of mice and rabbits. The family that has watched the baby owls grow plans to do some of that doting, Chuck Lister said. 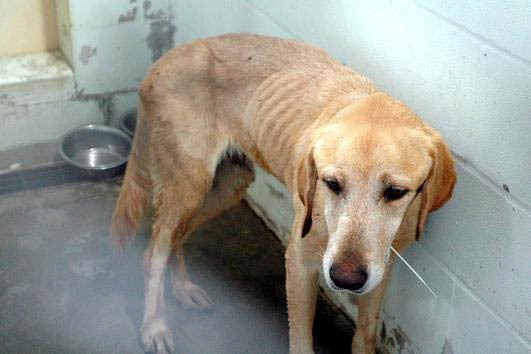 MARYLAND -- On 20 April 2010 at 4:00 PM, a deputy from the Wicomico County Sheriff’s Office began an investigation into animal cruelty that allegedly occurred inside a residence in the 1500 block of May Drive in Salisbury. During the investigation the deputy learned that Mark Laird, 20, was accused of placing a cat that belonged to the complainant into the microwave and turning it on. Upon initiating the investigation, the complainant advised that the cat went outside and has not been seen since the microwave and is believed to have possibly succumbed as a result. After meeting with both the suspect and witnesses, the deputy determined that the incident warranted charges being filed. The deputy completed an Application for Statement of Charges and received a warrant for Laird’s arrest from the District Court Commissioner. 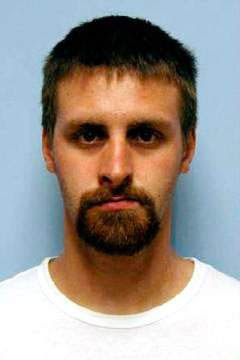 On 28 April 2010 the deputy placed Laird under arrest for Animal Cruelty. After processing at the Central Booking Unit and an initial appearance in front of the District Court Commissioner, Laird was released on Personal recognizance. 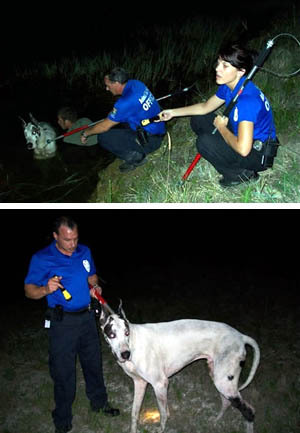 FLORIDA -- Lee County Animal Services is trying to identify the owner of a Great Dane they rescued from a Lehigh Acres canal Tuesday night. Animal control officers say the dog was reported by two people riding ATVs in the area of 12th Street. LCAS says it appears the animal broke his chain and somehow ended up in the canal with the chain wrapped around his legs. They say one of the young men who found him staying in the water up to his waist for over an hour to keep the dog from drowning. 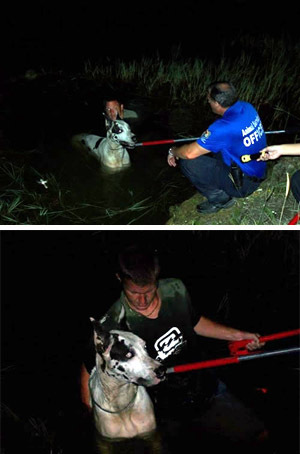 Rescuers from animal services, the fire department and the sheriff's office helped rescue the 165-pound dog. Animal services says he has a microchip, but the chip was never registered with them and they haven't been able to identify the vet who implanted the chip. Anyone who recognizes the dog or has any information can call animal services at (239) 533-7387 (LEE-PETS). OHIO -- A Millcreek Township man pleaded guilty Monday in Erie County Court to charges stemming from a dog attack that left his 3-year-old niece with severe injuries. Matthew J. Havern, 26, pleaded guilty to charges of dog attack causing serious injury, failing to register a dangerous dog, failure to maintain liability insurance for a dangerous dog, and failure to obtain a rabies shot and a license for his dog. In exchange for his plea, the Erie County District Attorney's Office dropped charges of reckless endangerment, tampering with evidence and a misdemeanor dog attack count. The dog, a pit bull mix named Graham, had attacked another toddler in 2006, causing similar injuries. It was euthanized after the most recent attack, which occurred when it attacked Havern's niece, Alorah Havern, in September. Matthew Havern's lawyer, David Ridge, explained his client's decision to plead guilty rather than seek a trial. "His concern from the very beginning has been for the child. That is why he is taking responsibility," Ridge said. 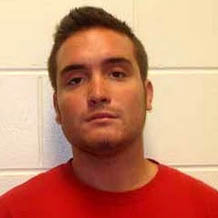 Judge Ernest J. DiSantis Jr. accepted the plea. He scheduled sentencing for June 28. The charges carry a maximum possible sentence of up to seven years in prison and a $50,600 fine. The dog attacked Alorah Havern on Sept. 16 at the Millcreek Township residence Matthew Havern shared with his mother, Debbie Havern. Debbie Havern, Alorah Havern's grandmother, was baby-sitting the child at the time. The girl suffered a fractured skull and required more than 300 stitches to close her wounds, her mother, Julie Havern, has said. Alorah Havern also lost many teeth and had numerous bones in her face shattered. She was treated at University of Pittsburgh Medical Center, where doctors told her family the child would likely be permanently scarred and blind in one eye. The dog had inflicted similar injuries to the 4-year-old daughter of Matthew Havern's girlfriend in November 2006 in Wesleyville. After that attack, Matthew Havern was charged with failure to confine his dog and owning a dog that caused serious injury or death. He pleaded guilty to both charges. The state also declared his dog a "dangerous dog." Under the state's dangerous dog law, Havern was required to install an enclosure that includes a secure top and walls that extend 2 feet into the ground; carry a $50,000 liability insurance policy; annually register the dog as a dangerous dog; and post signs around the home that indicate a dangerous dog lives there. Instead of complying with that law, police said, Matthew Havern falsely told a state dog warden that he no longer owned the dog.